The following tips stem from a segment I saw on Live with Kelly & Michael the other day. 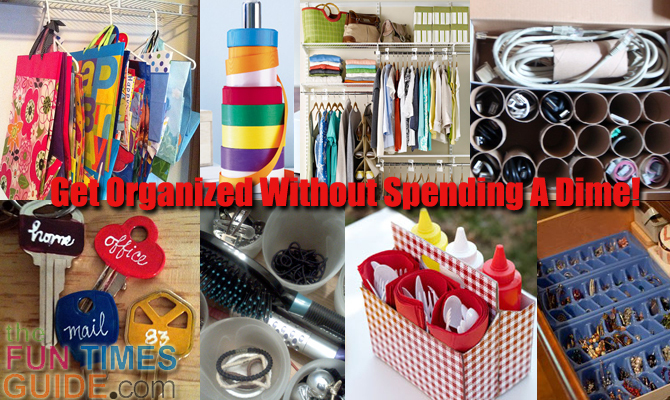 These are some of the best ideas I’ve seen for getting organized without spending a dime! One of the best ways to get organized for FREE is to repurpose items you already have around the house, and use them in a way that they weren’t originally designed for. With that in mind, here are the DIY storage organizers and tips I learned from watching Carley Roney (editor of The Nest) on Live with Kelly and Michael, plus my $.02 on those ideas and DIY ideas of my own. 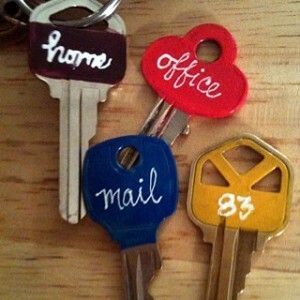 Be sure to click the links for DIY tips! #1 – For all of the tall boots in your closet, place a rolled up magazine inside each boot and it will stand tall on its own. MY TIP: This is a simple way to recycle old magazines. Bonus Tip – You could also use pants hangers to hang your boots. #2 – Create your own colorful bins for storing things on closet shelves, on the floor, etc. by simply wrapping old cardboard boxes with fun paper like wrapping paper. MY TIP: You could also use fabric, shelf paper, leftover scrapbook paper… whatever you have on hand. #3 – Make your own shelf dividers (using boxes and/or DIY spacers from things you have around the house) to start using that top-most shelf in your closet. 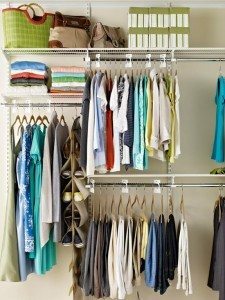 MY TIP: This is especially great for walk-in closets with wire shelving units, like mine. There’s an entire wall-to-wall wire shelf that’s completely empty above the area where the hangers hang. Bonus Tip – I love these ideas: using luggage tags as labels and using old name badges with clips as labels. #4 – Keep shoes in their original boxes. Simply take a photo of the shoes, tape it to the front of the box, and you’ll always be able to find the pair of shoes you want in a heartbeat. MY TIP: Another FREE shoe organizer idea is to repurpose a piece of furniture that you already have — like a closet-type hutch or bookshelf or a low-profile shelf unit. #5 – String your necklaces through straws so they never get tangled. MY TIP: This is a great thing to do when you’re traveling! Bonus Tip – Here’s a travel necklace saver that you could easily DIY rather than buying. #6 – To organize your earrings, pins, and rings use ice cube trays. Simply place the items inside the individual ice cube sections. Ice cube trays even stack nicely together one on top of the other. MY TIP: It would be fun to spray paint the ice cube trays in fun colors first to match your room decor. Personally, I would also line the bottom of each ice cube compartment with a piece of felt or a very small piece of that white cotton batting you find inside the box when you buy jewelry at a store. Bonus Tip – I also use pill organizers as travel jewelry boxes and to hold charms, clasps, and other tiny jewelry pieces that I don’t want to lose. 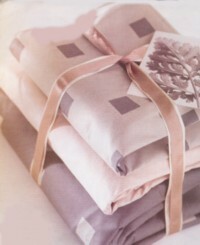 #7 – Use leftover holiday ribbon to bundle a complete set of sheets together for the guest bedroom. Then, you’ll never have to scramble to find a set of sheets again! 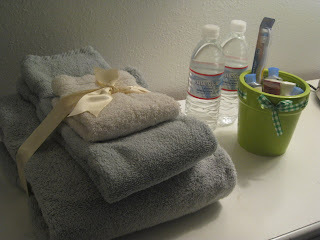 MY TIP: You can do the same thing for guest towels in the bathroom. Bonus Tip – Along these same lines, I also like Martha Stewart’s tip for storing bed sheets. (Although my sheet sets never fold quite so neatly or pack quite so thinly — even when I use these sheet folding instructions. #8 – Using an old corkboard and pushpins, create a ‘buttons & baggies station’ to store all of those tiny little bags of buttons and dyed-to-match thread that you get whenever you buy a new garment. This way, they’re all visible and it’s easy to find the one you need when you need it. MY TIP: This would look cute hanging on the wall in your laundry room! Especially if you jazz up the corkboard this way. Bonus Tip – It would also be handy if the corkboard is on the inside a cabinet door… in a laundry room, kitchen, etc. 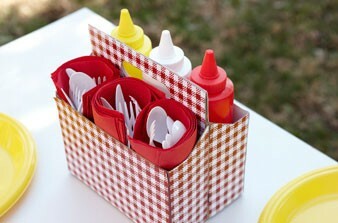 #9 – Create a handy condiment station for those things that you typically only use whenever eating burgers or hotdogs. Take an old 6-pack holder (divided cardboard carrier with handle), wrap it with contact paper, and tuck it away in the back of your refrigerator for those days when you need it. This saves a lot of valuable space on your refrigerator door that can be now be used for the things that you use more frequently! MY TIP: This is great for picnics and parties — makes it easy to carry 6 condiments (mustard, ketchup, pickles, radish, etc.) at once to the party location. #10 – Use old votive holders that no long have candles in them as drawer organizers! This is a great way to organize a junk drawer by giving you lots of small, confined spaces to store tiny trinkets in a drawer. You could use shot glasses as well. MY TIP: You could also use ice cube trays, pill organizers, or disposable plastic food containers. I’ve used some of the smaller Lock & Lock containers inside my drawers (as well as in our toolbox) to organize screws, nails, pins, pens, and miscellaneous bits & pieces. I’ve used disposable plastic food containers too. #11 – Use bright nail polish colors to color code keys that you use most often (front door, back door, gym locker, work office, etc.). MY TIP: Since we enter through the automatic garage door 99% of the time, I rarely carry anything other than the 2 keys to the cars that we own. They’re easily identifiable by their unique shapes alone. So my tip is for making it easy to grab & go the house key on those times when you need it (going for a walk, giving the petsitter or house guests a key, etc). Simply clip a single house key onto the end of a lanyard that you’ve received from some event or that came attached to an item you’ve purchased. The long, looped cord makes it easy to hang around your neck or from the rearview mirror of the petsitter’s car! #12 – To eliminate the clutter when storing cords and cables for all of your electronics, simply store them neatly folded inside a toilet paper roll. That sturdy piece of cardboard makes a great binder for bunches of wires and cords. MY TIP: You could also use paper towel rolls. Bonus Tip – The cardboard rolls can be used to keep cords at bay while you’re using electronics that are plugged in. 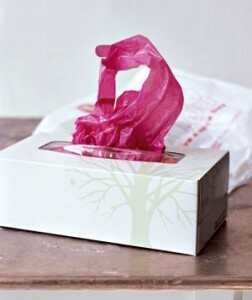 #13 – Use an old tissue box to store plastic bags that you get from department & grocery stores. Now it’s easy to grab a bag on the fly! MY TIP: The more bags you fit inside the box, the harder it is to pull one out each time. So instead, recycle the majority of your plastic bags by taking them to recycle bins found inside stores. Then, stuff a smaller number of bags inside the tissue box. When your supply gets low, add a few more. #14 – Use an old paper towel holder to store spindles of holiday ribbon on. Simply slide the rolls of ribbon over the vertical pole. This will give a new home to about a dozen or so rolls of ribbon, depending on thickness. MY TIP: If you don’t have a spare paper towel holder, then make one. Personally, I like using an old shoebox to store ribbons. Here are even more fun ideas for storing ribbon. #15 – To store all of your holiday gift bags, folded sheets of wrapping paper and tissue paper, use hangers that have skirt/pant clips on them (or use trouser pants hangers with multiple bars on one hanger). Hang your bags & paper right from those clips or over the center bar and store in the back of a closet. Or, simply drape the handles of the bags right over the neck of the hanger itself. MY TIP: You can also do this with all of the shopping bags you’ve been saving. I’ve been saving ’em for years, because you never know when you’re going to need a sturdy — disposable — tote. Bonus Tip – You can use pants hangers without clips too, and even plain ‘ol regular hangers!